JNN 05 Jan 2014 Baghdad : Iraqi security forces and local tribesmen have started a sweeping operation against militants linked to the al-Qaeda terrorist group in the western province of Anbar. According to the Media Reports, gunmen from the Albu Assaf and Albu Ali tribes have entered the city of Ramadi to help security forces clear the city of militants. The militants, who have been tightening their grip on the Anbar region near war-torn Syria for months, stormed police stations in both cities on Wednesday. The next day, the Sunni tribesmen made a deal with Iraq’s Shi’ite-led government to fight them. Dozens of militants were reported killed on Friday. Dressed in black and waving al Qaeda flags, Islamist insurgents battled tribesmen for control of the Iraqi city of Ramadi on Friday, while in Fallujah they grabbed loudspeakers after weekly prayers to call for support. Some reports also suggested that a major militant leader, Hassan Abu Dagdash, has been killed in clashes with Iraqi forces. The turmoil, and recent deadly attacks in Lebanon, illustrate how the war in Syria, where mostly Saudi backed Wahabi rebels are battling President Bashar al Assad, who is backed by Iran & Russia, threatens to infiltrate in neighboring countries. Al Qaeda’s Islamic State of Iraq and the Levant (ISIL) is trying to create a state ruled according to Wahabi practice across the Iraqi-Syrian border and has joined forces with powerful groups fighting against Assad. At least 40 of the militants, who fought with machine guns and pick-up trucks mounted with anti-aircraft guns, were killed in Ramadi, medical and tribal sources told Reuters. There was no casualty figure for tribesmen or security forces. The army, which had withdrawn from Anbar on Monday, has been deployed on the outskirts of Ramadi and Falluja to back the tribesmen against al Qaeda, in what is set to be a critical test of strength for the government. The deal with the tribesmen against al Qaeda echoed a decision by local tribes in 2006 to join forces with U.S. troops and rise up against al Qaeda forces who seized control of most of Iraq’s Sunni areas after the 2003 U.S. invasion. American troops and local tribes finally beat al Qaeda back in heavy fighting after a “surge” of U.S. forces in 2006-07. CIA has Planned To Fan sectarianism and to divide the country on Sectarian Lines , for which even Maps of Sunni , Shia and Kurd ruled states were even shown , Divided which was even easily controllable and manageable for the US to Keep its Presence in the region , with its Hegemony . On Thursday agreement between the tribes and the government appeared to go some way towards tipping the balance against Wahabi terrorist seeking to establish local control. “Those people are criminals who want to take over the city and kill the community,” said Sheikh Rafe’a Abdulkareem Albu Fahad, who is leading the tribal fight against al-Qaeda in Ramadi. He said around 60 militants were killed in the fighting, declining to give a casualty figure for the other side. Reuters could not independently verify that death toll. Fighting was getting increasingly difficult as militants had positioned snipers on top of the buildings, Fahad said. 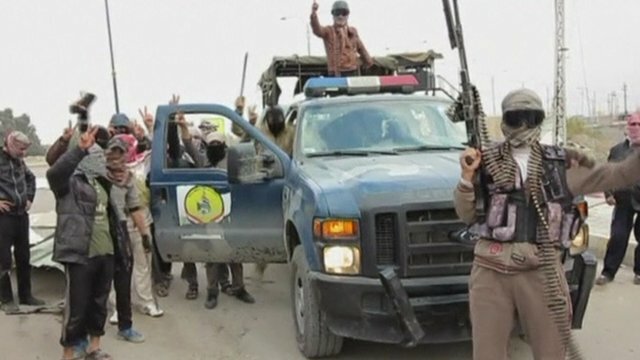 Further complicating the situation, not all the tribesmen were prepared to join the fighting against al Qaeda in Anbar, where tribal ties are strong. There were no clashes between tribesmen and militants in Falluja, eyewitnesses said, but masked insurgents have control over large parts of the city and have set up several checkpoints in the city. Wahabi terrorist grabbed loudspeakers after Friday’s prayers to call on worshippers to back them, the witnesses said. This entry was posted in Iraq News, Middle East and tagged Al-Qaeda, Anbar. Bookmark the permalink.